Fall is the time to clean and put away patio furniture so you'll have comfortable, attractive pieces for those occasional warm nights. 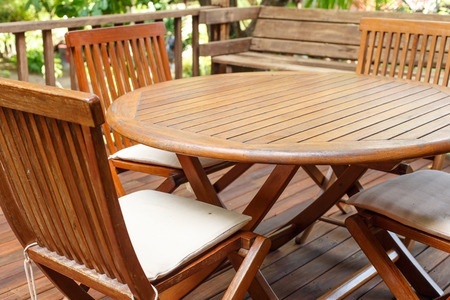 If a summer's worth of outdoor entertaining has taken its toll on your patio furniture, now is the time to clean it - before you stash it away for winter. No matter what type of patio furniture you have - wood, iron or metal - it has to be cleaned and minor repairs made before settling in for a long winter's nap so it will be ready to roll again next spring. Here's the fall patio furniture cleaning routine to get your outdoor furnishings primed for storage. Fall patio furniture cleaning and repairing has its rewards: You'll have comfortable, attractive pieces that can be pulled out of storage and used on those occasional warm winter days. And repairing old outdoor furniture in the fall usually costs half what you'd pay for new replacements. Worn straps and cushions can be replaced, and patio umbrellas and furniture can be re-covered now, when prices and wait times for repair are often much less. In the spring, patio furniture repairs can take eight to 12 weeks because suppliers are swamped with orders. Wash vinyl straps and vinyl-coated fabrics with a bit of laundry detergent mixed in a bucket of warm water. Use a rag or a soft-bristled brush to scrub straps, breaking down baked-on or sticky stains carefully as not to mar the sheen. Never use bleach on vinyl because it can damage the finish, allowing the porous material to stain, fade and weaken faster. Elbow grease is your hero here. Rinse thoroughly and dry. Seal with a vinyl protectant. Protectant also makes resin stacking chairs easier to clean. What about that rust or brown spotting - a chemical reaction to the sun's ultraviolet rays - on your favorite chaise lounger? Quick action now can ensure the chaise is usable next spring. If you catch them when they first adhere themselves, the dark spots are relatively easy to clean away with soapy water. For really tough stains and spotting, Blast Liquid Soap can be used - safely - as a last resort. If you have wrought-iron furniture, chances are you have light rust spots. Most of the middle- to high-end manufacturers use a sophisticated paint process to inhibit rust, but they cannot prevent it. There's no such thing as rustproof wrought iron. It just has to be watched over and cared for. These fall patio furniture cleaning tips can help. To remove light rust spots from wrought iron furniture, use a rust dissolver applied with a metal brush. The apply a primer and touch-up paint. Clean aluminum patio furniture with a car-rubbing compound, then coat with a clear car wax (Turtle Wax is green) to protect the finish from the elements. Brighten dingy umbrellas and fabric chair cushions by using cool, soapy water and a nylon brush, followed by a thorough rinsing to remove any cleaner residue. Then open the umbrella and let it air dry. Now is also the time to check that all the umbrella spokes are in their sockets, that the mechanics are working properly and that the seams of all the seat cushions are intact. Hammocks - both polyester and cotton - need extra care to survive a cold, wet winter. Clean a hammock by submerging it in a bathtub or large sink filled with warm water. Scrub any grimy spots or blights with mild dishwashing detergent and a nylon-bristle brush. Allow the hammock to air dry fully. Put your hammock away in a dry, sheltered area, such as a shed or a garage. Don't roll it up - moisture can get trapped inside. This will allow mildew to grow, and by the time spring comes around, it won't be usable. Instead, fold it in half and hang it by its end rings. Wood furniture, whether it's the most expensive teak or inexpensive redwood, also requires regular care, including gently sanding away surface dirt and grime. Follow with exterior penetrating oil to keep the surface looking lustrous. Wood is a lot like skin. If you were sitting in the sun, your skin would dry, age, and crack. Wood does the same thing. Teak Oil not only protects the wood but keeps it looking good as well. The key to extending the life of outdoor furniture is preventative maintenance. Clean regularly, keep seat cushions indoors when not in use and invest in patio furniture covers. Store all patio furniture in an upright position to allow for proper drainage. Storing upside down may cause water to accumulate and freeze inside the frame, causing premature structural damage.